Ten years ago I sat down and read Michael Crichton’s novel State of Fear. While far from his best work, it was his usual roller coaster of a techno-thriller. And, rather strangely, it was blatantly Ayn Rand-like in its political speeches that attempted to convince the reader that the government and the environmental movement conspired to keep you in a state of fear in order that you could be controlled. His was one of the first loud voices of the climate change deniers to use pseudo-science claims, his propelled by compelling, cliff hanging scenes. I thought, well hell, two can play that game. In 2010 I started Torrey House Press (THP) along with Kirsten Allen to promote love of the land through literature and the power of the pen. The stories we tell convey the values we hold. Literature matters because it is a vehicle for sharing our values and shaping our culture. As America’s nineteenth-century cities grew more industrial, writers, artists, and musicians looked west for inspiration, and in the process changed American identity by incorporating the heroes and hardships of mountain men, miners, and pioneers. The West was the last frontier, the last place settled by Europeans—and for good reason. With annual precipitation sometimes a quarter of that typically received east of the Mississippi River and strewn with unnavigable rivers and canyons, the West didn’t offer much promise of successful settlement. The literature shaped by the West shows an evolution of identity and values. Mark Twain explored the ruggedness of the Western landscape and the people who settled and developed it despite its crushing difficulties. John Muir suggested that the wild places being conquered held other benefits, some more spiritual than material. Edward Abbey went further, arguing not only that wild places are a spiritual resource but also that our land management practices are destroying them. Today, writers such as Timothy Egan, Erica Olsen, Brooke and Terry Tempest Williams, and Stephen Trimble contemplate both the desolation of destruction and the still point of hope that can lead us to new ways of living with the land. In Utah, for instance, there are concrete examples of conservation created by literature. Much of the popularity and protection of Arches National Park and other Utah red rock wonders are the result of Edward Abbey’s Desert Solitaire. A couple of years ago Bear River Migratory Bird Refuge manager Bob Barrett told Kirsten and me that he thought the refuge owed its very existence to Terry Tempest Williams’ beautiful memoir, Refuge. Indeed, living with the land is the crux of our culture here in the West. And celebrating our place-based culture adds richness to our lives. To further the tradition, Torrey House Press is launching an e-book only series called Torrey House Press Green Shorts, and Wildlife News’ own Ralph Maughan is our first author contributor. For Green Shorts material, THP is reaching out to conservation activists, scholars, and managers, folks like wildlife and range biologists who have stories to tell and experiences that are worth reading about. These are often unsung heroes out working on the front lines of conservation who have a passion for what they do. Ralph is a perfect example. Ralph Maughan chose to live in the Intermountain West because of the beauty of the surrounding natural landscape. But in the fall of 1979, millions of some of the most beautiful acres in the world were under eminent threat of uncontrolled logging, mining, road building, and development. The political heat surrounding the issue prompted then-Senator Frank Church to wear a bullet proof vest to public hearings. Hearings where loggers compared conservationists to Charles Manson. Ralph wrote us an entertaining and enlightening story of the creation of the Frank Church—River of No Return Wilderness Area. 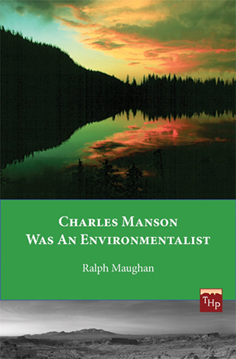 Titled Charles Manson was an Environmentalist, Ralph’s piece can be found at your favorite e-book retailer for $1.99. Twenty-five percent of the proceeds will go to Western Watersheds Project, a conservation organization whose board of directors includes Ralph Maughan. Buy a copy, be entertained, learn something useful, and in so doing, make a worthy contribution. -Mark Bailey and Kirsten Allen are Co-Publishers at Torrey House Press. -try going the Digital Print On Demand route. Most of the big modern print companies will gladly run as few or as many copies as you need…Three or 300. If you can output the book as an ePub file, there’s no reason it can’t be formatted as a PDF for press-ready printing and binding, with a soft cover , for a cost of < $ 3.00 for a 100 page book , 6 x 9 inch give or take. Self-publishing is encouraged. The old business model of using a Publisher middleman, printing books by the hundreds or thousands and stocking them in another middleman's distribution brick and mortar warehouse, is dead. That's where the dregs in those bookstore bins and Big Box sales tables come from…needless overprinting overstocked undersold books and too many people in the middle of the supply chain. Today you go straight from computer to buyer/reader with a quick pass thru the automated press, printing only what's sold , shipping label and all. Zoom. That's the minimalist workflow. You can still go the long and involved route if you wish, but the niche market is better served by Print On Demand and ePub. I bought the ebook and read it on the ipad. I prefer a real book, LOL. The only advantage of an ebook is the linked dictionary! I love being able to touch a word on the screen and, wa-la! A dictionary pops up. Love it! Otherwise, I prefer paper. Whether I’m reading a paper or a book, I read with a pencil in my hand so I can make check marks and notations as I read. I also use those those small ‘sticky tabs’ and when I read a passage that I may use as a reference or one I simply want to remember and read again I’ll place a sticky on the spot. It makes it so easy to return and find the passage. LOL, if it was a good book it will have a lot of little sticky tabs (what are those things called!?) hanging off the pages. Great article – I’ve always loved writing centered around the West. Congratulations also to Ralph! Congrats Ralph! Looks very interesting….